In Greek meethologie, Menelaus (/ˌmɛnɪˈleɪəs/; Greek: Μενέλαος, Menelaos, frae < μένος· vigor, rage, pouer + λαός· fowk, "wrath o the fowk") wis a keeng o Mycenaean (pre-Dorian) Sparta, the husband o Helen o Troy, an a central figur in the Trojan War. 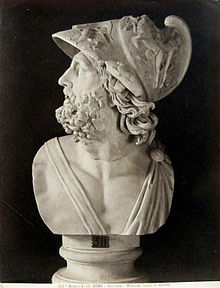 He wis the son o Atreus an Aerope, brither o Agamemnon, keeng o Mycenae an, accordin tae the Iliad, leader o the Spartan contingent o the Greek airmy during the War. Prominent in baith the Iliad an Odyssey, Menelaus wus an aa popular in Greek vase pentin an Greek tragedy, the latter mair as a hero o the Trojan War nor as a member o the doomed Hoose o Atreus. This page wis last eeditit on 11 Mairch 2017, at 04:18.